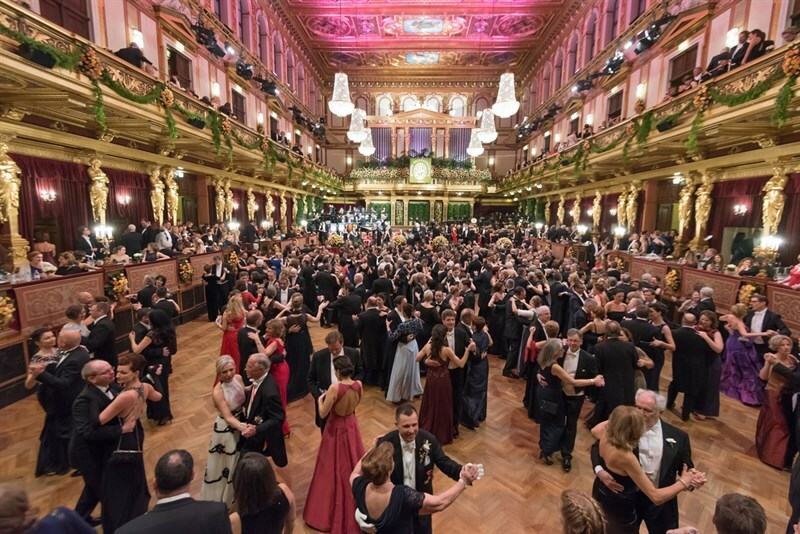 Once a year during "Fasching", the Vienna Musikverein is transformed from a venerated concert auditorium into an elegant ballroom and provides a stunning backdrop for the Vienna Philharmonic Ball, an event which has been a highlight of this festive season in Vienna for several decades. The Musikverein in Vienna is not only the orchestra's artistic home, but serves as a magnificent venue for hosting the orchestra's annual ball as well. The Golden Hall and the entire building are decorated with countless floral arrangements to provide a festive atmosphere for the proceedings, and the seats on the main level are removed to form a large dance floor. Every year, the President of Austria is the honorary patron, and members of the Austrian government as well as the governors and mayors of Vienna and Salzburg belong to the honorary committee. © WPH / Jeannette Handler ≡ InfoBall der Wiener Philharmoniker | + Zoom The first highlight of the evening's festivities is the ceremonial opening in the Golden Hall. The areas around the main floor and on the upper level fill an hour beforehand with guests securing for themselves a good vantage point from which to view the proceedings. Richard Strauss composed a festive fanfare for the first ball in 1924, and this work has been performed at every ball since that time. When the brass players of the Philharmonic begin the fanfare from the balcony overlooking the hall, the entrance of the guests of honor begins. At the head of this long procession is the evening's Honorary Conductor. 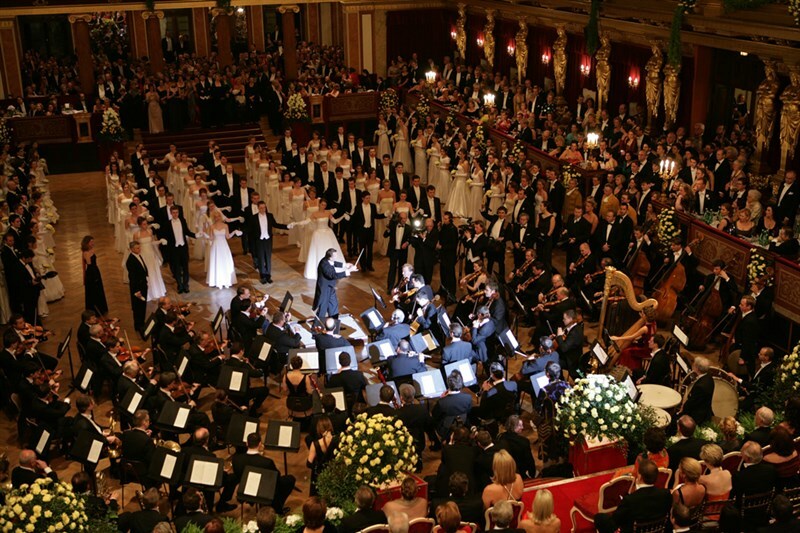 In contrast to its concerts, the Philharmonic sits in the middle of the dance floor on this occasion, in order to make room on the stage for the guests of honor, which include numerous luminaries from the world of art, politics, and society, as well as supporters of the orchestra who comprise the membership of the ball's Patronage and Honorary Committee. Once all prominent guests are seated, the Honorary Conductor leads the Philharmonic in a performance of a popular composition from the orchestra's repertoire. 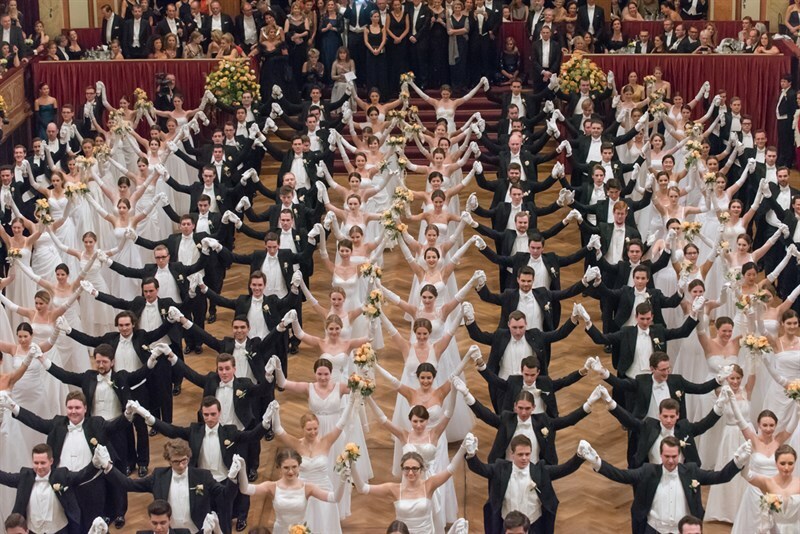 © Richard Schuster ≡ InfoBall der Wiener Philharmoniker | + Zoom Following this musical treat, the Philharmonic clears the floor while a group of debutantes and their partners make their entrance to officially begin the dancing. Young ladies of at least 17 years of age, in floor length white ball gowns, and young men of at least 18, in black tails, promenade into the hall to the traditional sounds of a polonaise by Chopin or Ziehrer. Specially selected dancers from this group then perform an appealing dance number which is choreographed and rehearsed by the evening's Master of Dance who also directs the joint quadrille at midnight, which is repeated at 2 AM. The Master of Dance speaks the only official words of the evening at the close of the opening ceremonies, when he proclaims "Alles Walzer! ", inviting all ball guests to join in waltzing with the debutantes on the main floor. © Richard Schuster ≡ InfoBall der Wiener Philharmoniker | + Zoom Throughout the evening, the center of the ball remains the Golden Hall. During the rest of the year one of the finest concert halls in the world, the hall is dedicated on this one night exclusively to ballroom dancing. 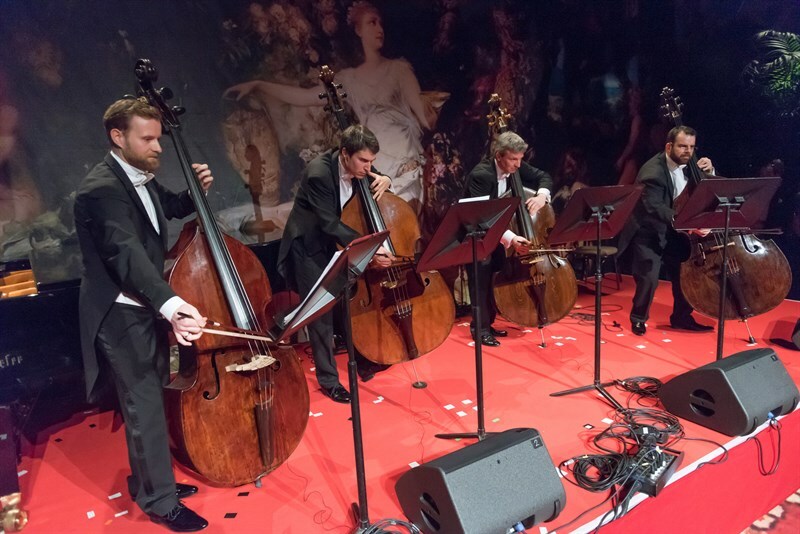 A large ball orchestra provides a steady stream of Viennese waltzes and polkas, and is relieved periodically by a modern big band, swinging with a more contemporary beat to add variety. For many years now, the "Grosser Wiener Ballorchester" under the direction of Helmut Steubl has played the traditional dances, while bands such as James Last, Max Greger, Hugo Strasser, Ambros Seelos, The Pasadena Roof Orchestra and others have provided up-to-date sounds for a super-charged atmosphere. © Richard Schuster ≡ InfoBall der Wiener Philharmoniker | + Zoom The action is in no way confined to the Golden Hall, however. In the smaller rooms and halls of the building, where throughout the year world famous artists perform, one can take a rest from the dancing and enjoy the company of old and new friends. In the Gottfried von Einem Saal there is the effervescent Bösendorfer Bar, and various buffets provide necessary sustenance throughout the night. There is a romantic Viennese "Heuriger" as well as the new discotheque in the Metallic Hall.